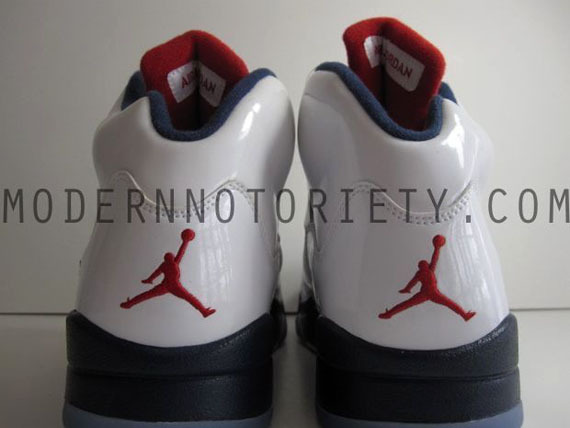 PROPS TO MODERN NOTORIETY FOR THE IMAGES !!! Yesterday Sneaker News provided you with a look at two upcoming Air Jordan V Retro releases for the Fall 2011 season. 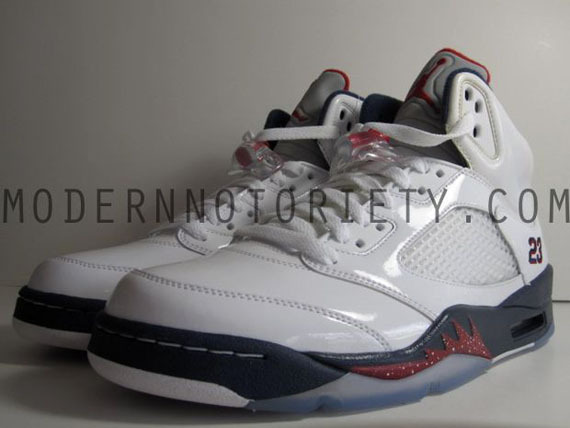 Here’s another look at the White/Midnight Navy-Varsity Red colorway, currently scheduled for a July 2011 release. It features a pristine white patent leather upper with an Olympic-inspired combination of Midnight Navy on the midsole and Varsity Red on the sharks teeth detail, speckled with white. The translucent outsole is paire with a white outsole at the toe and midfoot as well. Midnight Navy is used on the inner lining with red on the inner face of the tongue, with a red Jumpman stitched on the heel and navy/red ’23′ stitched on side. 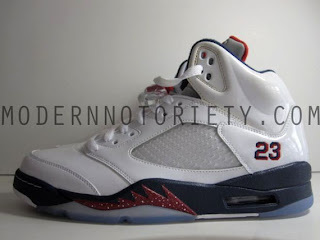 Continue reading for another detailed look at the Air Jordan V in White/Midnight Navy-Varsity Red and stick with BLVDAVE for more Air Jordan Retro developments.